As he marched along Jackson Boulevard on May 1, Pablo Anguiano toted a white sign with neatly printed red letters that read: “We also have a dream.” The Mexican native joined the throngs of hundreds of thousands, including immigrants from Poland, Ireland and Senegal, converging on Grant Park. A laborer who lives in the Pilsen neighborhood, Anguiano explained that the sign was a conscious tribute to Martin Luther King Jr.’s famed “I Have a Dream” speech, delivered on August 28, 1963, in Washington, D.C. Speaking 100 years after President Abraham Lincoln signed the Emancipation Proclamation, King said he and the other 250,000 marchers had come to redeem the nation’s lofty but unfulfilled promises. “And so we’ve come to cash this check, a check that will give us upon demand the riches of freedom and the security of justice,” King said. The May 1 march, Anguiano hoped, would help demonstrate that immigrants are tax-paying, law-abiding people worthy of full membership in American society. “I have a dream of becoming a citizen and my kids [to have] the right of education,” said Anguiano, who has been in the United States for 15 years. Plenty of other people in Chicago are joining Anguiano in moving into the path forged by King. Immigrants and people with disabilities have drawn on the tactics, philosophy and spiritual basis of the modern Civil Rights Movement—including King’s 1966 Chicago campaign, known as the Chicago Freedom Movement—to make Chicago a national hub for activism for their respective communities. “The disability community has greatly benefited from the work of Dr. King, not just technically but spiritually,” said Marca Bristo, president and chief executive officer of Access Living, an organization promoting independent living, providing services and advocating for people with disabilities. “There’s a spiritual affinity with the kind of work –¦ a real appreciation that the goal of the movement, as he said, was not to stop segregation, but to foster true integration. “That resonates with us because we remain amongst the most segregated people in the world,” Bristo said. Chicago has become one of the national leaders in the immigrant rights movement this year. A demonstration on March 10, which drew an estimated 100,000 people, began a season of nonviolent protests that were credited, by many, as being a significant factor in changing public discourse on immigration legislation. The May 1 rally, which drew an estimated 400,000 people, was among the nation’s largest. Only Los Angeles—a city of close to a million more people than Chicago—had similar crowds attend related events that day. Los Angeles’ Latino and Asian populations were both twice as large as Chicago’s in 2000. Luz Vega-Marquis, president and CEO of the Marguerite Casey Foundation, a private foundation in Seattle that seeks to strengthen the voice of low-income families, said that the depth of relationship between Chicago’s immigrant and racial minority communities sets the city apart from others. “Chicago is definitely setting a trend for the nation,” said Vega-Marquis, whose organization has supported the work of Chicago’s Coalition of Asian, Arab, African, European and Latino Immigrants, known to many as CAAELI, for the past three years. In addition, Chicago’s immigrant movement is powered, in part, by techniques honed during the civil rights movement. 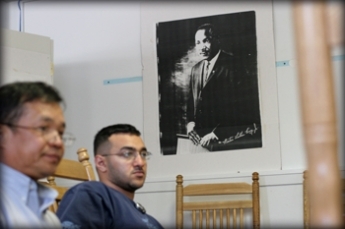 The importance of that movement is visible the moment one enters CAAELI’s main meeting room in the Lake View neighborhood and sees three blown-up pictures of King, including a standard portrait and an image of him talking with teachers. Dale Asis, CAAELI’s director and one of the lead coordinators of both the May 1 and March 10 immigration rallies, said the immigration rights movement has direct ties to the modern civil rights movement of which King was such a major part. The ties begin with citizenship education and ordinary people’s participation as a key to solving social problems. CAAELI draws on the example of the New Market, Tenn.-based Highlander Research and Education Center, an institution founded in 1932 to provide education and support to people fighting economic injustice, poverty, prejudice, and environmental destruction. Highlander played an instrumental role in the civil rights movement—King and Rosa Parks are only two of the center’s more famous alumni—and CAAELI teaches its members about the importance and value of civic participation through its citizenship schools. Through learning how to read, write and vote, Asis explained, students develop awareness about the issues they face, as well as strategies to address them. “We are not instilling the basic mechanics; we are trying to invoke civic participation,” Asis said. Despite their recent successes, CAAELI and other groups are not resting, Asis said. After the May 1 march, the group sent a contingent to Washington, D.C., to lobby federal legislators. The group is also holding forums in neighborhoods with immigrant communities throughout the city, culminating in a citywide neighborhood forum. “People know –¦ they can make a difference,” Asis said. People with disabilities also have learned that they can make a difference. After addressing issues of self-acceptance and pride, Chicago’s disabled activists have branched into independent living, legislative advocacy and even architectural concerns. In early 2007, the organization will move from its offices at 614 W. Roosevelt Ave. to a $13 million office space at 115 W. Chicago Ave. on the Near North Side. Organized under the principal of “universal design,” which attempts to create the highest level of access for the greatest number of people, the building represents a continued movement toward civil rights, according to Jack Catlin, fellow in the American Institute of Architects and partner with LCM Architects in the South Loop. “The disability movement is based on the Civil Rights Movement of the 1960s –¦ because civil rights is about not excluding people from programs, services and public accommodation,” Catlin said. “Up until the disability movement, that did not involve architecture. “[That] the design of the environment can create discriminating conditions is one of the most fundamental elements of the disability movement,” Catlin said. Intended to be a national model, the commercial office building aims to rectify those conditions through myriad features that begin even before people enter the building. The curb where wheelchair users can be dropped off is set back five feet from the street to ensure that the wheelchair is at street level. A ramp, with a slope that is one-third gentler than most ramps, leads up to the top of the curb. Activated by a proximity sensor, the front door opens to a vestibule. Inside is an information desk, much of which is 30 inches tall—an appropriate height for many wheelchair users, according to Catlin. Chicago’s disabled community is a multi-faceted one that includes longtime activists like Bristo, a supportive mayor in Richard M. Daley, and academic and artistic elements. The Mayor’s Office for People with Disabilities works to support the city’s more than 600,000 people with disabilities, while Equip for Equality does legal advocacy work for the community. The University of Illinois at Chicago is one of the nation’s few universities to have a Disability Studies department and was the first to grant a doctoral degree in that field. And Chicago hosted its third annual Disability Pride Day in July. Artists and activists throughout the city worked to create the Chicago Festival of Disability Arts and Culture. This 10-day citywide celebration premiered in April and featured visual and performing arts that explored disability issues and showcased the work of artists with disabilities. As with the immigrant rights movement, effective cooperation between different elements of the community is an integral element of its success, according to Andy Imparato, president and CEO of the American Association of People with Disabilities in Washington, D.C. The accomplishments include Access Living’s being one of the nation’s first 10 federally funded independent living centers, and part of a model that has been replicated in more than 20 communities in Illinois and in more than 400 sites across the country.